The beginning of Catholic Schools in Peace River started in 1950 when the Catholic taxpayers of Peace River affirmed the wish of the majority of the Catholic voters to form a separate school. The first School Board members were Mr. Wilf Martz, Mr. Frank O'Neill, Mr. Ed Glasser, Mr. John Stuffco and Father Albert Bouchard. Mr. Martz and Father Bouchard became the Chairman and the Secretary-Treasurer of the board. The work of building a school began with attaining permission from the Government of Alberta followed by procuring a loan through the Archdiocese of Grouard-McLennan. Construction on a new school began and was completed on September 1st, 1951 in the Parkview subdivision. It began as a Grade 1 class taught by Sister Donnelly. By 1952 enrollment increased to 32 students making the original one-room school house too small. This resulted in a second school being built across from Our Lady of Peace Catholic Church. This new school of Immaculate Conception was completed on January 31st, consisting of three classrooms. In 1955, Sister Rita McLennen came to Peace River to teach grades 3 to 8 as well as serving as the Principal through 1957. In 1956-1957 enrollment increased to 139 pupils which resulted in four classrooms being added. This was the year Sister Mills came to Peace River becoming the Principal of the newly renovated Immaculate Conception school. Three years later, in 1960, Sister Margaret Denis carried on the dedicated work of having a Catholic Junior-Senior High School in Peace River. As a result of yet another enrollment increase to 262 students, the School Board attained permission and funds from the provincial government to build a new school just beside the original schoolhouse. The school built in 1967 contained four classrooms and a small gym. 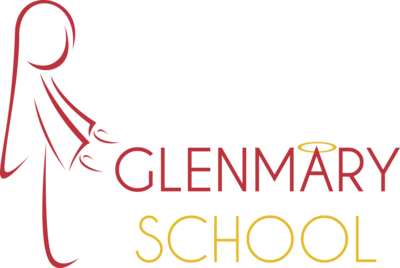 Sister Gillespie, a teacher at the school came up with the name Glenmary, "Glen" came from the area of town called Glenview and "Mary" was carefully selected as a devotion to Mary Mother of God. Sister Margaret Denis became the first Principal of Glenmary School.